Do blogs make reporting restrictions pointless? The leaked DNA test on 13-year-old alleged dad Alfie Patten has revealed a big problem with court-ordered reporting restrictions in the internet age. (NB This is a cut down version of a much longer original post on blogging and reporting restrictions that was featured on the Guardian). Court orders forbidding publication of certain facts apply only to people or companies who have been sent them. But this means there is nothing to stop bloggers publishing material that mainstream news organisations would risk fines and prison for publishing. Even if a blogger knows that there is an order, and so could be considered bound by it, an absurd catch 22 means they can’t found out the details of the order – and so they risk contempt of court and prison. This entry was posted in newspapers, online journalism, regulation, user generated content and tagged blogging, citizen journalism, comments, google, journalism, law, research, Trinity Mirror, user generated comment, user generated content, wordpress on March 31, 2009 by Paul Bradshaw. From September I will be running an MA in Online Journalism at Birmingham City University. I hope it’s going to be different from any other journalism MA. That’s because in putting it together I’ve had the luxury of a largely blank canvas, which means I’ve not had to work within the strictures and structures of linear production based courses. The first words I put down on that blank piece of paper were: Enterprise; experimentation; community; creativity. In the Online Journalism MA’s first stage (Certificate) students will study Journalism Enterprise. This will look at business models for online journalism, from freemium to mobile, public funding to ad networks, alongside legal and ethical considerations. I’m thinking at the moment that each student will have to research a different area and present a business case for a startup. They will also study Newsgathering, Production and Distribution. I’m not teaching them separately because, online, they are often one and the same thing. And as students should already have basic skills in these areas, I will be focusing on building and reinventing those as they run a live news website (I’ll also be involved in an MA in Social Media, so there should be some interesting overlap). The second stage of the MA Online Journalism (Diploma) includes the module I’m most excited about: Experimentation – aka Online Journalism Labs. This is an explicit space for students to try new things, fail well, and learn what works. They will do this in partnership with a news organisation based on a problem they both identify (e.g. not making enough revenue; poor community; etc.) – I’ve already lined up partnerships with national and regional newspapers, broadcasters and startups in the UK and internationally: effectively the student acts as a consultant, with the class as a whole sharing knowledge and experience. Alongside that they will continue to explore more newsgathering, production and distribution, exploring areas such as computer assisted reporting, user generated content, multimedia and interactivity. They may, for example, conduct an investigation that produces particularly deep, engaging and distributed content and conversation. The final stage is MA by Project – either individually or as a group, students make a business case for a startup or offshoot, research it, build it, run it and bid for funding. By the time they leave the course, graduates should not be going into the industry at entry level (after all, who is recruiting these days? ), but at a more senior, strategic level – or, equally likely, to establish startups themselves. I’m hoping these are the people who are going to save journalism. At the moment all these plans are in draft form. I am hoping this will be a course without walls, responding to ideas from industry and evolving as a result. Which is why I’m asking for your input now: what would you like to see included in an MA Online Journalism? The BJTC’s Steve Harris has mentioned voice training, media law and ethics. The BBC’s Peter Horrocks has suggested programming and design skills. You may agree or disagree. Let’s get a conversation going. This entry was posted in online journalism and tagged advertising, community, computer aided reporting, courses, enterprise, entrepreneurship, future journalism, investigative journalism, journalism education, Journalism.co.uk, ma online journalism, ma social media, masocialmedia, online journalism education on March 25, 2009 by Paul Bradshaw. Are UK newspapers and journalists selling links? I’m waiting for a response from the Telegraph. Comments invited. “The articles you have highlighted do contain some affiliate links. This is an accepted means by which online publishers monetise their content. This entry was posted in online journalism and tagged links, Telegraph on March 24, 2009 by Paul Bradshaw. Thanks to a prompt from Jemima Kiss, I realised it’s Ada Lovelace day today. Thanks to Suw Charman-Anderson, I’ve signed a pledge to blog about a woman in technology I admire. Well in that sentence alone I’ve already mentioned two. I’ve already blogged about two other women in technology I admire: Jo Geary and danah boyd. So that makes 4. Aleks Krotoski, for instance, a games journalist and PhD student who has not one great Delicious feed, but two, which are both worth following. If more journalists were this well informed and transparent, more readers would be too. Or Beth Kanter, a leader on how nonprofit organisations can use social media. Or Alison Gow, Sarah Hartley, Angela Connor, or Amy Gahran, four more journalists using new technologies in innovative ways. They happen to be female. I don’t think that matters. I hadn’t thought about it until now. But I’m going to spend the next 20 minutes following links in the Twitter search for #adalovelace and a Technorati search for the same. Hope you can join me. Did you find anyone new? This entry was posted in online journalism and tagged ada lovelace day, adalovelace, alison gow, Amy Gahran, Angela Connor, beth kanter, danah boyd, Jemima Kiss, Jo Geary, sarah hartley, suw charman-anderson on March 24, 2009 by Paul Bradshaw. 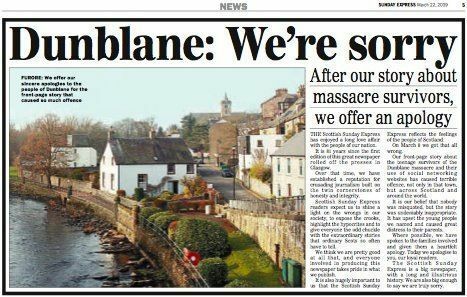 2 weeks ago the Scottish Sunday Express led with this cover story (PDF) on how the survivors of the Dunblane massacre were turning 18 and – shock, horror – drinking and making rude gestures. Reporter Paula Murray, it seemed, had “managed to inveigle her way into a Facebook friendship with teenagers from the town and write a salacious piece about their “antics”, based on information culled from their profiles.” You can read it in full here (text) and also here (PDF). The original was quickly taken down. This entry was posted in newspapers, online journalism and tagged apology, bloggerheads, dunblane, ethics, Express, facebook, graham linehan, paula murray, PCC, Press Complaints Commission, scottish sunday express, social networking, Virginia Tech on March 23, 2009 by Paul Bradshaw. Many of the services that are being developed as part of the ‘semantic web’ are necessarily works in progress, but they all contribute to extending the success of this burgeoning area of technology. There are plenty more popping up all the time, but for the purposes of this post I have loosely grouped some prominent sites into specialities – social networking, search and browsing – before briefly explaining their uses. This entry was posted in online journalism and tagged browsing, community, computer aided reporting, firefox, headup, iGlue, OpenCalais, Powerset, research, search, semantic web, SemantiFind, social networking, Thomson Reuters, Twine, web 3.0, wordpress on March 23, 2009 by Paul Bradshaw. There are billions of pages of unsorted and unclassified information online, which make up millions of terabytes of data with almost no organisation. It is not necessarily true that some of this information is valuable whilst some is worthless, that’s just a judgement for who desires it. At the moment, the most common way to access any information is through the hegemonic search engines which act as an entry point. Yet, despite Google’s dominace of the market and culture, the methodology of search still isn’t satisfactory. Leading technologists see the next stage of development coming, where computers will become capable of effectively analysing and understanding data rather than just presenting it to us. Search engine optimisation will eventually be replaced by the ‘semantic web’. This entry was posted in online journalism and tagged community, computer aided reporting, google, journalism, Nova Spivack, OWL, RDF, research, search, semantic web, tagging, tim berners-lee, Twine, Vint Cerf, web 3.0, WWC on March 22, 2009 by Paul Bradshaw.